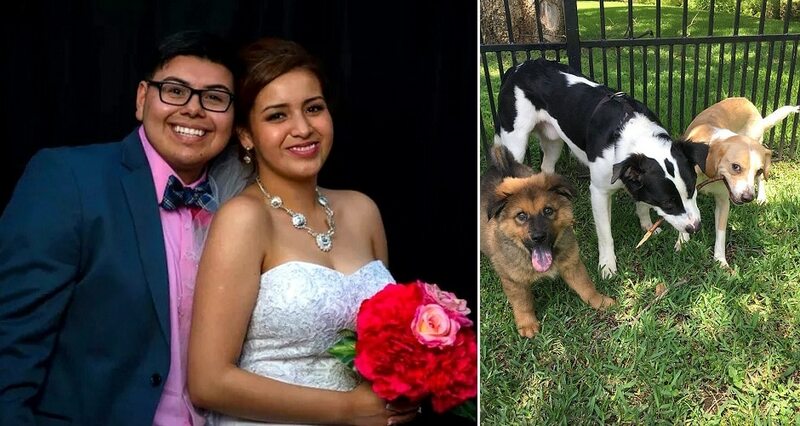 Texans Neydi and Carlos Romero have been married for three years, and on each of their wedding anniversaries they have celebrated by adopting a dog. Hopefully they’ll be happy together for a long time, and hopefully they have enough room! The Bedford couple didn’t plan to make this their tradition, but growing up, Neydi wasn’t allowed to have dogs, so she knew as an adult that she wanted a houseful of them. But getting one actually came as a surprise for Neydi. “Carlos got our first dog, Captain, as a surprise for me,” Neydi told The Dodo. “We had talked about getting a dog since we got married, so he got him for the first-year mark. 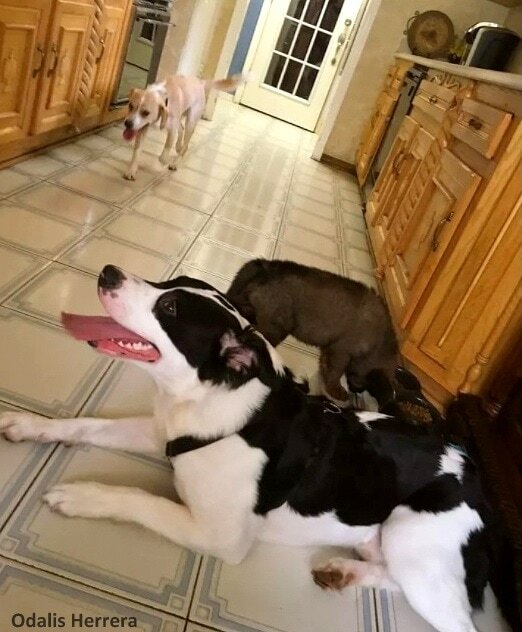 “Captain is a sweet, smart, and independent dog. He is the one that takes care of me when I am sad or sick,” she said of the Australian shepherd/blue heeler mix. “He loves to go to the park and get chased by his doggie friends. “Then for the second anniversary, we brought in Teddy. Carlos [and I] were talking about how we get a dog every single year and we were talking about continuing with the tradition. “He was infected with tapeworms and severely underweight when we first got him,” she said, explaining how the Lab/beagle mix was being given away for free on Craigslist, and that a year later he was vibrant and full of life. Then year three rolled around, and in came Chewy. The shepherd/husky mix wasn’t Neydi’s choice, but when she saw what the shelter was like, she knew they had to save him. 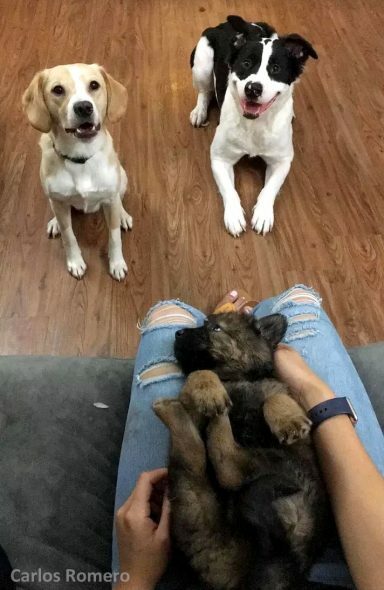 At first, adding a puppy to the mix was a bit stressful, but now they seemed to have found their groove. Neydi’s sister Odalis shared the family’s custom on Twitter, and now it’s got a lot of people thinking about boosting their own #relationshipgoals. 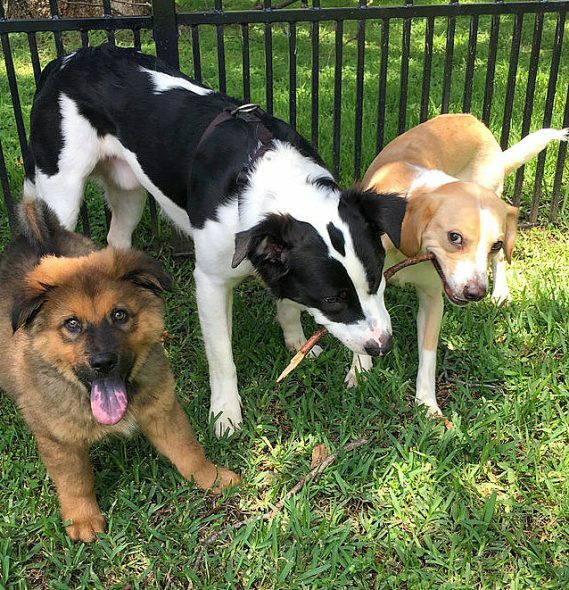 “I was glad to know my sister wanted to shelter these dogs and make them a part of her family. 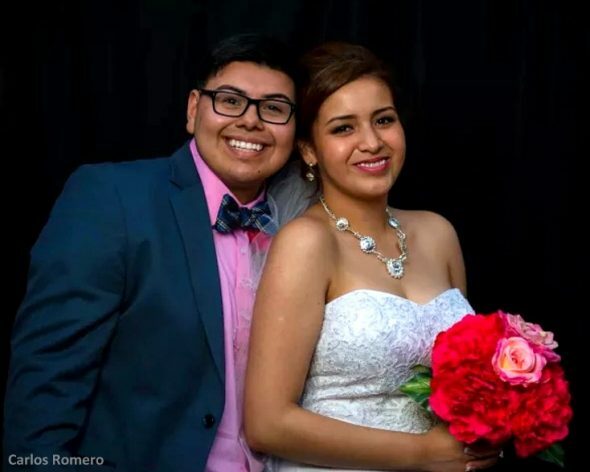 They’re like my nephews,” Odalis Herrera said. “I really do feel like having them has taught my brother-in-law and sister a lot more about patience and love. However, Neydi wants people to realize that pets aren’t just gifts, but family members for life. But the Romeros don’t have infinite funding or room, so they’re setting the limit at five. “We’re going to try to push till our fifth anniversary, and from there we’re going to stop,” Neydi said laughingly. 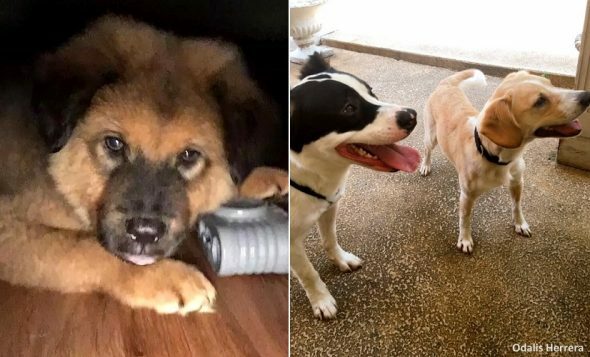 But their ultimate goal is to one day turn their home into a rescue where they can foster dogs. Great story. I really enjoyed reading this. 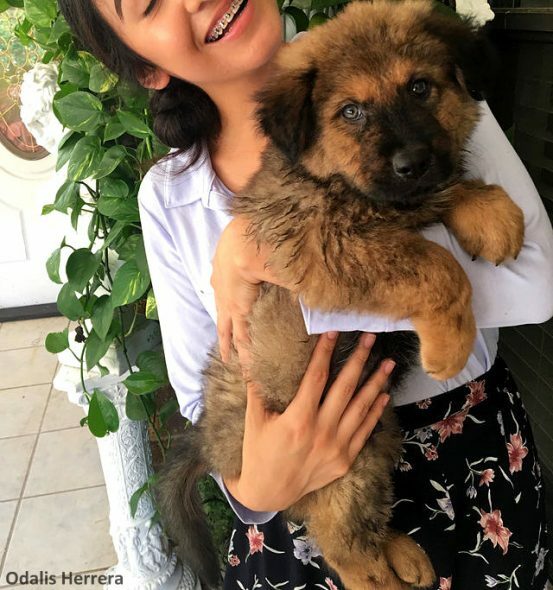 I could never have a dog growing up either and my husband got a dog for me as a surprise after our first year of marriage. I could not live in a house without at least one dog. Wish I could do the same. It’s not a good story! What do they do in year 5 or 6. Stupid people will see this and think it’s a cute idea. It’s not . These may be good owners but it’s not a good reason. In the article, they said they would stop at 5. It is a wonderful and loving tradition. 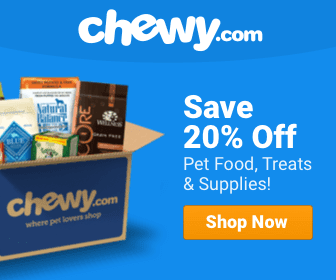 Don’t want a “houseful” of dogs? Start adopting SENIOR dogs…they are (usually) past the destructive stage, housebroken, and know basic commands. AND are REALLY appreciative of another chance at a loving home (as MOST rescue dogs are) !! After reading this story, I am giving a lot of thought to making this a tradition at MY house ! Giants War Hack – Unlimited Crystal and Gold for you device iOS and Android. MARVEL Strike Force Hack – GET Unlimited Gold and Power Cores for you device Android or iOS !